Often a gift made by hand is valued far more weight than the most expensive - is bought for money. Using the representation schemes origami you will be able to create a great masterpiece of paper and use it as a gift to loved ones. The heart of the strips of paper in origami style is perfect for Valentine's Day, and other manifestations of attention and love. 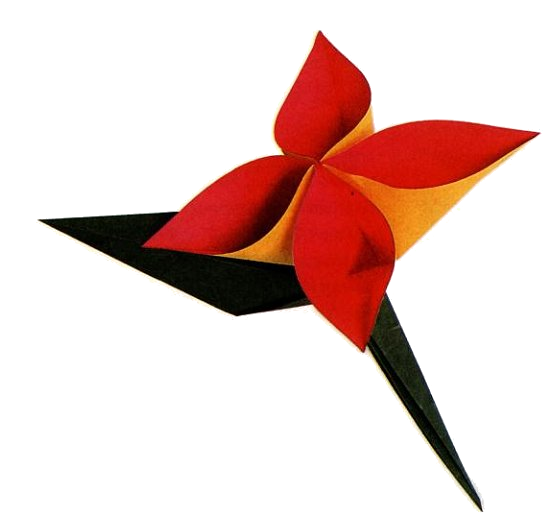 Very high quality book on origami flower. A lot of detailed diagrams of flowers, bouquets and vases. Colored diagrams and illustrations make the book very enjoyable to read. Enjoy. The book contains a diverse set of schemes of boxes of paper detailing the steps in English. In it you will find the boxes from simple square (for storing various small items) to fine polygonal gift. Even very pretty, fabulous basket of securities. For example, for Red Riding Hood. The scheme is quite clear and self-explanatory is not required.